UPDATE - 3/16@9:58AM: Far Cry is finally available on iTunes US. Thanks to reader Gary M for the heads up. UPDATE - 3/14@1:45PM: Reader batperez just let us know in the comments that Far Cry is now available on Real.com at this link. UPDATE - 3/14@9:54AM: Bug iTunes US here. UPDATE - 3/14@9:27AM: According to a couple of the comments it's up on Napster. Still no word on iTunes outside of Canada though. Far Cry is now available for download on iTunes in Canada. I'm not sure about the US and elsewhere though. It's even one of the features on their homepage. So buy a copy if you are able and so inclined - if for no other reason than to support the band. And if you haven't heard it yet - where the hell have you been?! 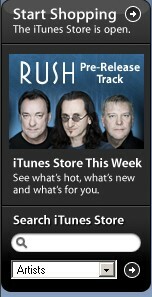 ;) Go to Rush.com and give it a listen. Thanks to reader Andy G for the heads up.